Sleep is an incredibly important time during the day when our bodies are given the chance to relax and regenerate, but if you are asking yourself ‘why am I still tired after 8 hours of sleep?’ it can be quite disconcerting because, on the face of it, this should be plenty of time to wake up feeling refreshed. In this article we will look at the factors that affect sleep, and how you can optimize the benefits it brings. To answer the question of why you are waking up tired after 8 hours of sleep, we must first understand what sleep is. It was long thought that sleep was a dormant stage during the day, but with extensive research over the past few decades researchers have found that a lot still goes on during those restful hours. By lying in a horizontal position blood can easily pass around the body and replenish the muscles after the days activities. The reduced movement further assists the process by allowing the muscles to completely relax and focus on resting. Rather than being similar to the reduced actions of the muscles, your brain remains a hive of activity during this time. It is thought that this happens because when the brain isn’t receiving large amounts of incoming signals, it is able to filter through all of the information it has gathered in the previous day and decides what is relevant or irrelevant. It is basically filing away all the data you might need in the future and discarding what you won’t need again. A number of factors work together to make us feel sleepy and, ultimately, making us fall asleep. The first is simply our body feeling exhausted after a day’s activity. The cells need a chance to recover and repair themselves and send signals to the brain that it’s time to do so. It’s thought that a chemical called adenosine is intrinsically linked to this process, as it builds up in the bloodstream during the day and is broken down at night when we sleep. It interacts with the brain and alters the levels of neurotransmitters, such as serotonin and norepinephrine that affect how alert we feel and, conversely, how sleepy we feel. What Makes for an Effective Sleep? Many people can sleep in a variety of situations, but this is not necessarily providing them with an ideal rest. For your muscles to properly relax you need to sleep horizontally and with as much support as possible. It’s also important to get plenty of exercise during the day, sticking to a regular schedule of sleep so your body can get used to a routine, and sleep in a relaxing, peaceful environment. You should also aim for 8 hours sleep per night. Failure to do any of these can result in disturbed or ineffective sleep. This can be happening for a number of reasons that are associated with the way you are sleeping and prevent your body and brain from fully relaxing. Sleep cycles are crucial to how effective your rest is. Your body moves through 6 different stages throughout a sleep, each of which involves differing levels of activity in the brain and nervous system. The following behaviors all affect these cycles and interrupt them, meaning you won’t be getting a good quality of sleep, and will be left feeling tired afterwards. One of the main causes for this is modern day life with the use of electrical devices like a phone or e-reader prior to going to bed. These have been shown to emit blue light, which interferes with your brain’s production of melatonin- one of the hormones responsible for regulating your sleep cycle. To avoid these effects you should avoid using these devices for at least 90 minutes before going to bed, and leave your phone face down if it is in the room with you. Sleeping in a poor position will also leave you feeling tired in the morning, because it doesn’t let your muscles relax properly. It also means you are more likely to wake up during the night so you are spending less time asleep than you think. A similar effect also happens if you grind your teeth during the night, or if you drink alcohol or caffeine before bed. These all interrupt the sleep cycles and prevent adequate rest. The final common cause of tiredness is sleep apnea. It’s thought that up to half of adult women have this condition, which causes them to stop breathing for short times during the night. This can clearly affect the quality of sleep achieved, and will result in lethargic feelings the next day. If you think you may have sleep apnea it is worth consulting a doctor to see how they can help. Sleeping is necessary to feel refreshed and be prepared to tackle the day ahead, but if it is interrupted and doesn’t fulfill its purpose you can be left feeling exhausted, even if you have been in bed for a decent amount of time. 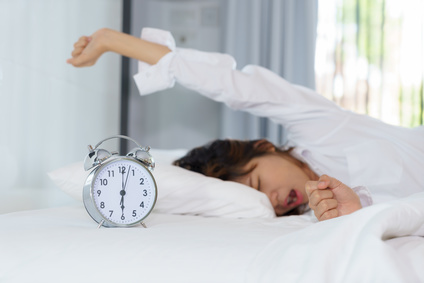 To answer the question ‘why am I still tired after 8 hours of sleep?’ in a simple way, it is likely that the environment is not ideal- luckily this is something that can easily be fixed and you’ll be feeling energized in no time.